Everyone knows that when given a choice, most people prefer face-to-face learning modes. And, of course, that goes double for learning complex things. Right? 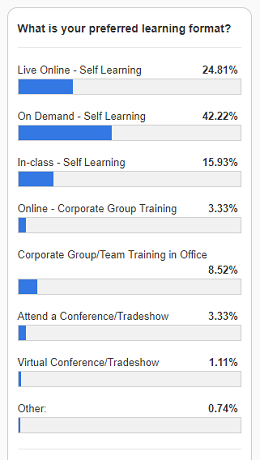 This survey suggests that given a choice, people prefer online learning modes. Of course, the sample size is limited and may be skewed by being conducted thru an online portal. But, it does point out a continuing trend. Interestingly, a colleague and I were talking recently about how much we like facilitating virtual classes. That is certainly not a sentiment I had several years ago when I started doing online teaching. As organizations have practiced delivering online learning, and students have consumed online learning, we’ve all gotten a lot better at making online learning experiences work well. Even without considering the technology changes that have occurred in the last five years, online learning is easier, more enjoyable, and more beneficial than it used to be. Still, these numbers seem inconsistent with what I have heard from students over the years and what I’ve held to as conventional wisdom about training modalities. The survey inspired me to review what’s to like and not like about the various modes of delivery to get some perspective on how and why preferences have evolved. Below are some of my observations about the three primary modes of delivery that are most common: Live in-person; Live virtual (online); On-demand virtual. What’s not to like about live, in-person learning? It’s rich with human interaction. This is the easiest environment in which to exchange complex ideas, work through problems that require give and take, and learn from each other. Other students or team members are right there to give you feedback on the spot. You can really get to know them. You can even share snacks with them! Obviously, a skilled facilitator is key to making in-person learning a positive experience. However, it takes effort on the part of participants to make this work, as well. Particularly when team dynamics are challenging, which they often are, team members must tap into their reservoir of soft skills to work through them. It is hard to escape difficult team members when working together in a classroom setting. Live training is the closest to real life and perhaps has the greatest ability to help transfer skills from the classroom back to the job. Not to mention that you can’t mute the instructor or step away from your seat for a few minutes to take a break on your own time – at least not without causing considerable distraction. Also, in-person classes are typically done in longer chunks of time, often full days. That’s a long time to remain focused and get along with others. It used to be that training was a break from the daily grind. Perhaps as more people work offsite and often at home, a day of live training may be less of a break and more of a day of hard work getting along with others. Even with the demands of live, in-person learning, it’s a great mode for learning. There are benefits beyond learning the topic of the course. For novice professionals or students who are in transition, the immediate and personal feedback within the classroom experience helps build confidence. All participants, including experienced professionals, benefit from the interactions with others or hearing other perspectives. The ancillary learning that comes from sitting at a table face-to-face with others is invaluable in live, in-person classroom environments. In part 1 of this article, we explored recent trends in learning preferences from a recent BA/PM Times Poll. In the previous article, we examined some advantages and downsides to live, in-person learning. In this part, we cover some plusses and minuses of self-learning. In this context, we lose much of the non-verbal communication. It simply does not allow for the full presence of others with whom participants interact. Yet, in many ways this can heighten some aspects of learning. Without the distraction of the person sitting next to you and other commotion in the classroom, the communication channel between instructor and student can be intensified. In some ways, it’s more intimidating to contribute in a virtual classroom because your comments are so “exposed.” Everything anyone says in a virtual environment, particularly without video, seems louder than in an in-person setting. People may be more cautious about sharing ideas in a virtual environment because it can feel like every word is scrutinized. The opposite effect can happen depending on the person. Because it is not face-to-face, it may be easier for some people to speak up and participate who would not do so in an in-person setting. Still, a live online classroom is a great learning venue that allows for live interaction without the inconvenience of having to go to a classroom for live, in-person training. It eliminates traveling to a site for training, a huge plus for organizations spread across cities or countries. Plus, you can step away for a minute or mute others without causing a scene. Overall, it’s a lot less effort to work with others in this environment. Exercises and workshops in these environments tend to be more focused on getting the work done and there is less required of the soft skills to navigate the interpersonal dynamics when sitting at a table face-to-face with others. It has been my experience that judicious use of silence, frequent breaks, and good stress management in the face of technical problems go a long way toward making this environment ideal for many learners. Given the logistical simplicity of this approach, there’s a reason there has been such significant growth in this type of learning. So, we are left with the solitary experience of on-demand, self-learning. What exactly is the appeal with this format, which had the most votes in the poll? Given choices, why would someone choose to learn by themselves in an asynchronous format? This flies in the face of everything I’ve heard from students and what I have believed to be true about the best way to learn in the nearly 20 years that I’ve been teaching. A student who gets his math lessons online recently explained to me why he much prefers this approach to learning math: “It’s just them doing work with their voice over it and there aren’t things around me.” I understand that skills development is fundamentally different than math in a discipline that requires working with others, like project management or business analysis. But the comment sheds light on why there might be a preference for the solitary learning experience of on-demand virtual training. Ultimately, this lowest context learning experience is a lot less work than having to contend with other people, whether students or instructor. Not only can you learn from the comfort of your home office, but you don’t have to share ideas, be polite, or figure out how to get along with anyone. With the day-to-day politicking demanded of most people, a quiet, solitary learning experience becomes an easy sell. The best learning format for you depends on balancing goals, circumstances, and constraints, which should not cater only to preferences. A poor choice in balancing those considerations recently resulted in tragedy after two US Navy ships crashed. The crashes were attributed in part to a lack of training in which the captains were given a package of 21 CDs to complete their training. Thoughtful consideration of which format makes sense goes beyond student (or organizational) preferences for convenience. The good news is that learning providers have gained more experience in meeting online learning demands, and consumers have gained experience, as well. The result is more good options for skills development. Work environments are evolving, learning is evolving, and so are learner preferences. What trends are you seeing? Please leave comments about which learning modes you prefer and why.